If you are looking for an excellent way to enjoy Branson outdoor adventure, take a horseback ride and see expansive landscape of mountains, hills, valleys, and forests. With horseback riding adventure in the Ozarks, you will be able to see the beauty of Branson, pristine scenery, and awesome trails such as in Busiek State Forest, Bear Creek Trail, Dogwood Canyon, and Shepherd of the Hills Homestead. As you enjoy awesome horseback riding experience in these areas, you can have the opportunity to see waterfalls, amazing rock formations, and picturesque view of the Ozark Mountains. If the kind of Branson outdoor adventure you are looking for is horseback riding, grab your backpack and walking shoes and head on to Busiek State Forest Park. This state forest has many different trails of varying length and level of difficulty. The trails cover a length of about fourteen miles, most of it has shortcuts and loop back on each other, but these thrilling horseback riding trails are well marked for easy accessibility and maneuverability. Busiek State Forest Park features 18 miles of maintained trails shared by hikers, horseback riders and bikers. Bear Creek Trail Rides offer one hour guided horseback ride at Bear Creek Stables in Walnut Shade, a small community just 10 minutes from Branson. Bear Creek horseback riding provides visitors well-trained safe horses that are equipped with western tack. The trail packages for horseback ride are all affordable and they have a variety of well-trained horses that are gentle and easy to handle. When you are ready to ride, just pick out the breed and color that you’d like to ride and enjoy with it as you travel up and down the hills by streams and forests. 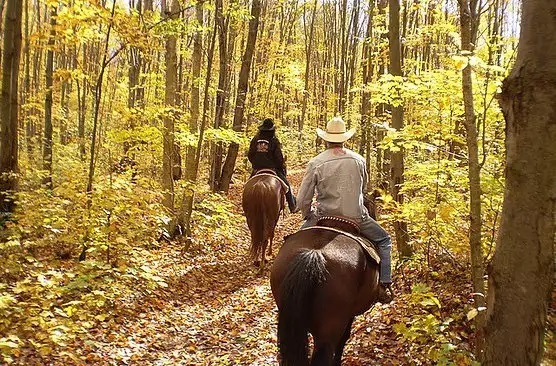 The Dogwood Canyon horseback riding experience offers a wrangler guide on a two-hour trail ride where you’ll enjoy panoramic views of the spectacular Ozark Mountains. On this tour, you’ll travel to ridge tops that give you a 360 degree view of the Ozarks, then make your way down winding valleys and across rolling pastures. On most trails, you may encounter some wildlife and you may actually see buffalo and longhorn cattle. You will also experience what it’s like to be a cowboy. After enjoying that wonderful outdoor adventure, you can stop for a hearty meal at the chuckwagon site. The gorgeous and historic Shepherd of the Hills Homestead offers great horseback ride adventure in a place where you’ll find the famous outdoor drama based on the best-selling book, The Shepherd of the Hills, authored by Harold Bell Wright. The Homestead offers a one-hour horseback trail ride through the spectacular Ozark hills. The ride adventure will include seeing the Old Mill Theater where the outdoor drama is performed, here you can have the chance to ride on one of the drama’s featured horses. That’s right, you might be riding on a horse used in the show. Horseback riding adventure in Branson is a great way to enjoy the beautiful scenery, wildlife, and the spectacular Ozark mountains.